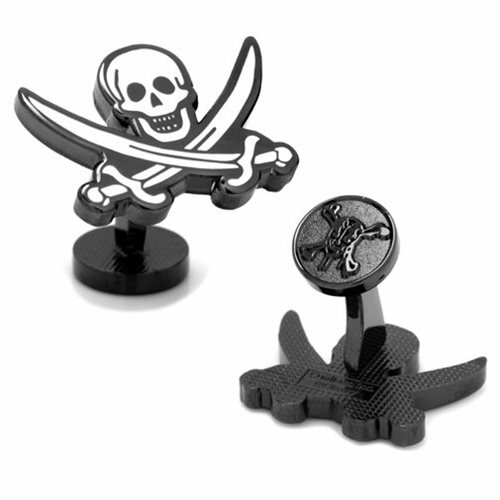 Yo ho it's a pirates life for you with these Pirates of the Caribbean Black Pearl Flag Cufflinks! There's no better way for a Disney fan to class up their suit than with these Pirates of the Caribbean Black Pearl Flag Cufflinks. Whether you're prepping for an interview with the big wigs or having a fun night out on the town, your suit simply can't go without these cufflinks. You can really flaunt your Pirates of the Caribbean fandom with these Pirates of the Caribbean Black Pearl Flag Cufflinks! The cufflinks measure about 7/8-inches wide x 5/8-inches tall.